Gisha, the Israeli NGO that blames Israel for all of Gaza's problems, released last year a Palestinian version of the Willy Wonka story in which the child's dreams are almost crushed by the evil Israeli enemy. The idea that Palestinian infighting, Egyptian closure of Rafah or Hamas terrorism has anything to do with the reality in Gaza today is not to be seen or heard. No, it is only Israel, for purely arbitrary and evil reasons, that decides to cruelly starve and destroy Gaza. Gisha used to never mention anything about Hamas restricting movement in Gaza until I shamed them into reluctantly admitting that, yes, sometimes Palestinians hurt themselves. The NGO's anti-Israel propaganda has been consistent and grossly unfair for years. When their own statistics started contradicting their anti-Israel claims - they simply removed the statistics from their homepage. Now they are brainwashing children to hate Israel as well. 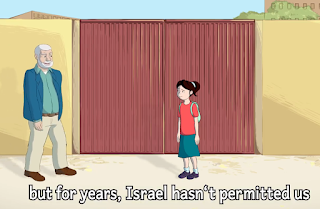 And they get millions from the EU to do this anti-Israel incitement and propaganda aimed at kids.